Everyone is doing great! We had a wonderful day going up Mount Tabor (Transfiguration), renewing Wedding Vows in Cana of Galilee, and celebrating Mass at the Grotto of the Annunciation in Nazareth. Nice dinner sitting around talking and then evening off and early to bed. If your parish has not yet sponsored an event for the Year of St. Paul — it is NOT too late. Ignatius Press has made it very easy for you. Join the Ignatius Press Night at the Movies and watch our exciting, informative and family-friendly movie “Paul, Contending for the Faith.” The movie was filmed in six countries and features me falling off a horse, coming down a wall in a basket, floating on driftwood on the Mediterranean, riding a motorcycle, descending into the catacombs, sitting on ancient toilets and more. 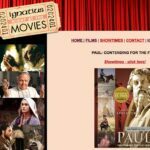 Click here for the website and find out how to set up a St. Paul Night at the Movies at your parish. For more information about this exciting venture, please contact Diane Hanson, toll free: 866-431-1531; direct: 734-455-1973; e-mail: dhanson@ignatius.com. Get some popcorn, invite the parish, friends and family — and have a great evening!